Disclosure: I was sent a Toopy and Binoo promotional pack from the vendor in order to become familiar with this animated series. All views I share are mine and mine alone. I recently had the opportunity to review an animated series with the girls called Toopy and Toopy and Binoo™. This series, which is geared towards children ages 2 to 6 yrs. 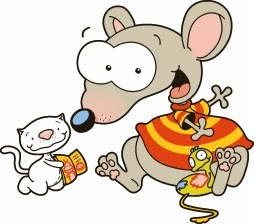 of age, follow Toopy, a tall, funny and oh-so friendly mouse and his best friend, Binoo, who is a tiny, clever and lovable white cat. Now you expect a cat and mouse to be enemies, but this is not the case with Toopy and Binoo. Like most preschooler-geared animated series, Toopy and Binoo is not only entertaining for parents and children to watch together, but it also teaches important lessons, daily skills and even encourages little ones to use their imaginations, just like Toopy does. Toopy and Binoo originally aired in Canada, but thanks to its popularity among young children, now you and your family can catch Toopy and Binoo on their very own exclusive Toopy and Binoo YouTube channel - http://www.youtube.com/user/toopyandbinootv. Featuring more than 100 full length episodes from this hit television series, your children will love meeting Toopy and Binoo and enjoying cute stories that will have them laughing and smiles -- while asking for more. After you are done checking out the new Toopy and Binoo YouTube channel, why not join me this afternoon at 1PM over on Twitter for the Toopy and Binoo Twitter Party, hosted by @ResourcefulMom, where you will learn more about this animated series and have a chance to win some cool prizes! Don't forget to follow Toopy and Binoo on Facebook and Twitter to stay up-to-date on news and promotions and more.